Push go and process until everything is a paste. It necessary, stop and scrape down the sides. If it is not blending enough, add more olive oil. 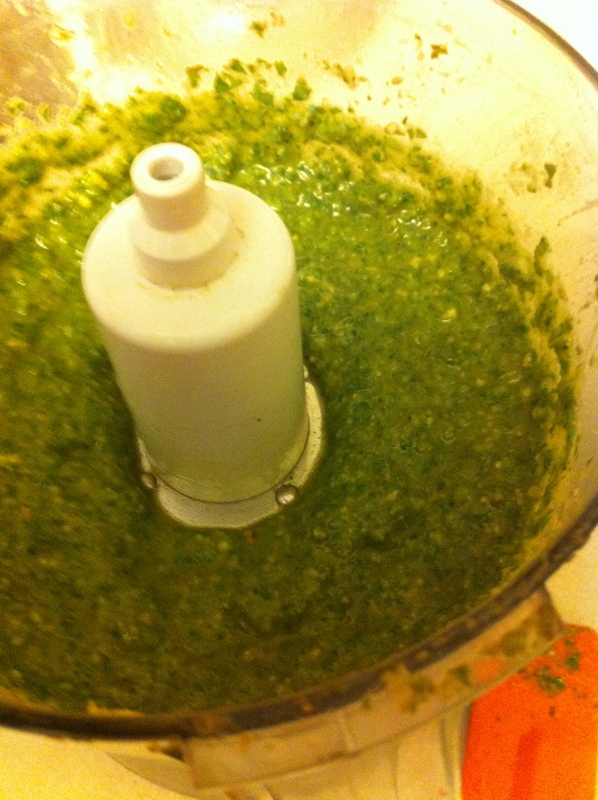 I use a mini food processor and this just about fills it up. This recipe yields about a half pint. If you are using a regular sized food processor you can double this recipe. I like to add the parsley because it supposedly keeps the pesto green, not to mention it has lots of vitamins and minerals. I don’t usually add parmesan cheese to the pesto but I add it when I serve it if I am in the mood. Pine nuts are so expensive and I usually have cashew and/or walnuts in the house so I like using those. This entry was posted in Healthful Eating, Recipes and tagged kid-friendly, local. Bookmark the permalink. Both comments and trackbacks are currently closed.